Mount Fuji is about ten miles across and two miles high and can be seen on a sunny day almost anywhere in central Honshu. 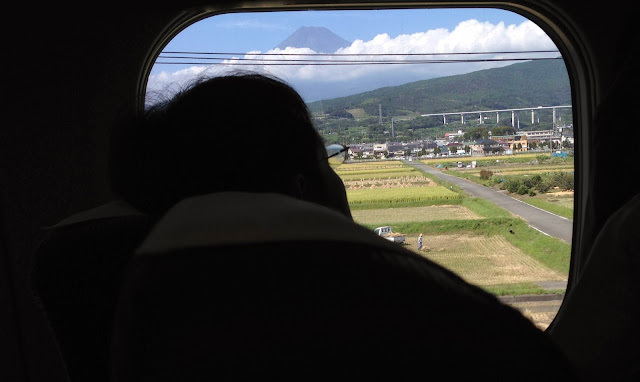 On our recent trip from Kagoshima to Tokyo the bullet train (Shinkansen) provided lots of good views of Mt Fuji (even without a window seat). Through the train window (in the photo above) we can see a farmer harvesting rice in the foreground, one end of a long viaduct in the middle ground, and Mt. 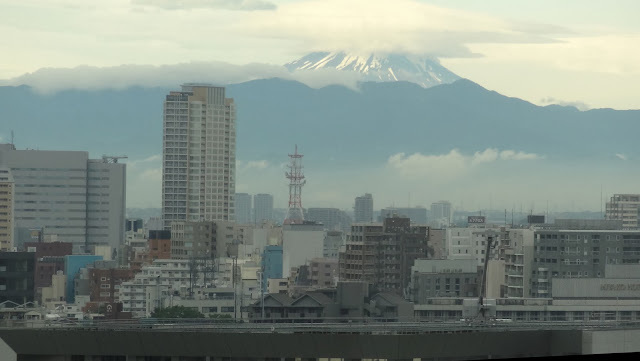 Fuji rising above the clouds in the background. Mt. Fuji is so omnipresent that several artists have made famous collections of 'Views of Mt. Fuji,' often with bridges in the foreground. The woodblock print above comes from 36 Views of Mt. 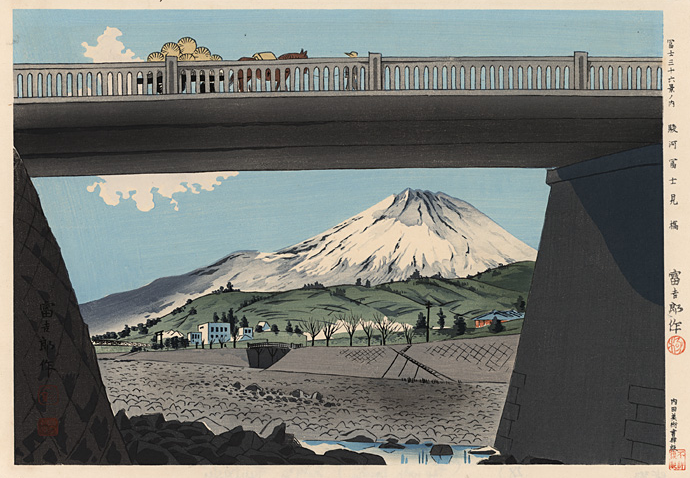 Fuji by the 20th century artist Tomikichiro Tokuriki. In this print the artist manages to make the bridge higher than the mountain. An even more famous collection of prints is from the 19th century artist Katsushika Hokusai's 36 Views of Mt. Fuji, where he captures the mountain under ocean waves and in a drop of dew. Over the years I've tried to capture Mt. Fuji whenever it makes an appearance. In this photo I'm sitting in my hotel room in Tokyo looking west at Mount Fuji with the Tamachi Station railway viaduct just visible in the foreground. Shizuoka Prefecture, Japan's Bridges: Mt Fuji Bridges by Mark Yashinsky is licensed under a Creative Commons Attribution-NonCommercial-NoDerivs 3.0 Unported License.